The SBC: Pro-Hell, Anti-Bell — Still Wrong! Well, it seems the firestorm ignited by Rob Bell’s Love Wins just won’t let up. 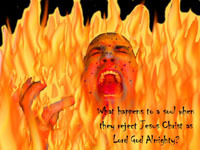 Now the Southern Baptist Convention has passed a resolution On The Reality of Hell (June, 2011), in which they reaffirm their belief in eternal conscious punishment for all “the unregenerate.” My thanks to Rachel Held Evans for her highlighting of this resolution (of which I had not heard), and to Mason Slater for linking to Rachel’s post in the first place. (Incidentally, follow that link to Rachel’s post…she makes an interesting argument that if the SBC is going to insist on the “Biblical foundation” of their doctrine of hell, they have to abandon their doctrine on the “Age of Accountability” which is nowhere in the Bible. Not my subject today, but it’s a compelling argument IMO). Anyway, since the SBC did us the favor of putting scripture references into the various clauses of their resolution, I figured this would be a good time to re-examine the New Testament survey on Hell that I did a few years back. For those who have not already seen it, you can download a table of all the passages I found on hell and punishment, and have a look at my commentary on them. I was gratified to see that the SBC’s reference pool is almost all included in my survey…whether we agree about the interpretation or not, we clearly accept the same writings as authoritative on the subject. In fact, going through every reference they listed, there is only one they used, but which I did not, that I think was actually an oversight on my part, and that’s Hebrews 2:1-4 (they only cite v. 3). As with the vast majority of the references I highlighted before, the writer of Hebrews is clearly speaking to those believers (in this case Jewish believers) who have received God’s message and believed, warning them not to “drift away” (v. 1) or “neglect” it (v. 3). In context it appears to me that this passage only reinforces my previous contention that the message of condemnation or punishment–to the extent it exists in the Biblical text at all–is meant as a warning to the believer and particularly to those (then, largely of the Jewish faith) who are certain of their salvation while ignoring or thwarting the message of Jesus. Condemnation to the “lost of the world” is not the subject. I would suggest that none of the story details are intended any more literally than any of Jesus’ other parables. The “meat” of this passage—like many parables—is likely the summary at the end, where Jesus says “If they do not listen to Moses and the Prophets, they will not be convinced even if someone rises from the dead.” Though his hearers certainly didn’t get this at the time, Luke’s readers definitely would have seen it as a further indictment of the Jews who refused to acknowledge Jesus. This text has been interpreted to mean that man only dies one time, and whatever happens after judgment is not death. This is really an inference of a statement not (necessarily) supported by the context, which is talking about the efficacy of Jesus’ death. An equally-valid reading would emphasize the “destiny” part of the sentence (at least in an Arminian worldview)—man is only destined to die once; what happens after judgment depends upon the outcome of that judgment and is not foreordained. Either interpretation is really a distraction from the central point which is the all-time efficacy of Jesus’ death (it’s about Jesus, not about us). In summary, the SBC resolution states: “That out of our love for Christ and His glory, and our love for lost people and our deep desire that they not suffer eternally in Hell, we implore Southern Baptists to proclaim faithfully the depth and gravity of sin against a holy God, the reality of Hell, and the salvation of sinners by God’s grace alone, through faith alone, in Jesus Christ alone, to the glory of God alone.” While I see the logic in their statement–and frankly, it’s the basis for evangelism taught by a great many Evangelicals throughout North America at least–it is not the logic of the Gospel of Jesus. Jesus commanded us to make disciples because he’s now king (Matt. 28:18-20). We need to “get the hell out” of our message and start talking about the Kingdom of the one resurrected and exalted by God. If we do that, we’ll be far too busy with the Kingdom to spend our energy on what happens to those who don’t acknowledge it. I should add as an epilogue that the SBC document actually included five other references I didn’t have in my “Condemnation” document. One, Rev. 15:3, just reaffirms that God is just…no argument there. Two, 2 Cor. 6:2 and Heb. 3:13 are cited as proof-texts against any notion that there might be an opportunity for salvation after death. Sloppy exegesis IMO, but not my argument one way or the other. One citation, Acts 17:30-31 states that God commands everyone to repent because one day he will judge the world. This could be interpreted as support for “turn or burn” evangelism…in fact it has been so interpreted by many. However if you look at the whole context (Paul’s speech at the Areopagus) he’s arguing for men to turn from idolatry to Jesus as the authority…the focus is on Jesus rather than false gods, not on punishment (Jesus is the one through whom God will judge the world). In any case, this passage does not “affirm the reality of hell” as claimed by the SBC…hell is nowhere mentioned and to automatically link the notions of “judgment” and “hell” is extrabiblical and does violence to the notion of judgment throughout the Bible. Their final citation that I did not include is John 10:10. Try as I might, I can’t figure out how this verse is relevant to the subject at all, so I really can’t answer this one. Solid exegesis (on your part). I agree that the New Testament’s witness to the popular image of hell is extremely shaky at best. That doesn’t even touch the completely different notion of Sheol that is dominant throughout the Hebrew scriptures. Thanks. The best part of your whole discussion is the statement that “it is all about Jesus” and the Kingdom. Whether as the motivation or the message, both Jesus, and whoever responsibly represents him, focus on an invitation to participate in the Kingdom (which he virtually always speaks of in the present tense), and NOT on ever-more-gruesome threats of what will happen to those who do not choose to join the King. Sadly, that is not the choice of many folks who claim to speak for him. I don’t have the final answer on this hell stuff, but I do know that we’re not doing ourselves any favors if any of these issues is off limits. We have to continue to parse through it, interact with it and grapple with the difficult concepts. Just found this post. Good stuff…. I’ll download your table for reference. I maybe borrow from it if for no other reason than to get the list of applicable scriptures — I’ve barely started on putting together a similar table myself. One of my primary reasons for blogging is to talk about Hell — I’ve been sitting on a non-traditional opinion for about 25 years, and felt called to start blogging/getting my thoughts out there last fall, before the whole Bell controversy hit the fan… errr, shelves. I’m going to put together a table like yours, but add a “checklist” like they do with software to show “this verse is compatible with this theory on hell”, etc. Good stuff. I’m glad we both commented on Kurt Willem’s site today. Please be sure and pop back here with a link when you write your stuff, Dan. I would love to engage you on this as you dig in! Thanks for popping by!